Physical Fence Required: No, he hasn’t shown a desire to escape back yard or a prey drive toward animals that would cause him to run, but he can jump a baby gate when he’s motivated. 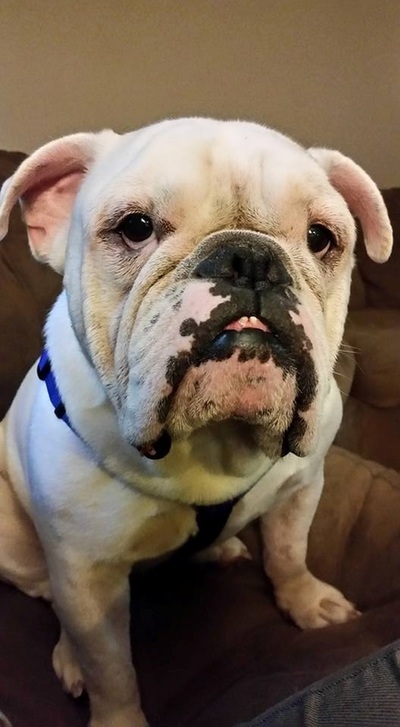 Please consider sponsoring Bama to help with his medical bills. 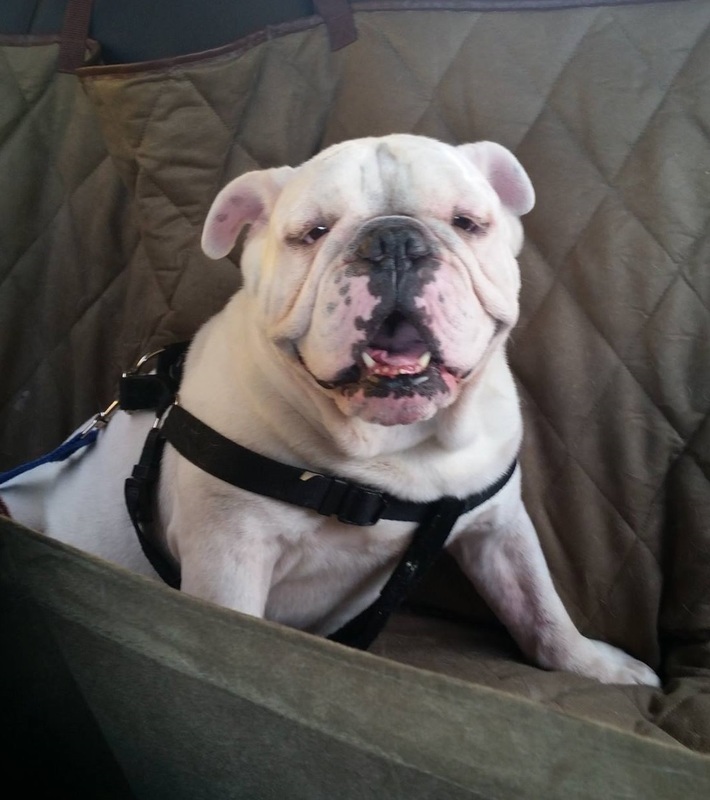 July 13 update: Bama is a sweet boy who loves to be wherever people are, hunt for stray kibbles, and go on car rides. He gets very excited about meal time, car rides, and when his people get home from work. The rest of the time he’s pretty low key. Once he’s eaten and got his lovins, he’ll mostly lay at your feet or on your lap like a lazy bulldog should. He doesn’t know that lap dogs have weight limits. He hasn’t shown aggression toward his foster sister, and actually seems pretty indifferent about most dogs. It’s the people he wants to play with. This weekend he met a 14 week male boxer puppy, a year old female pointer, and an overly yappy female mini dachshund. He was very tolerant of the boxer pup who wanted to run in circles around him, jump on him and bop him on the head with his paw. Bama didn’t react at all and ran a few circles around the yard with him. He did well with the female dogs he met too, but did vocalize his dominance when the pointer (taller than him) tried to bark at him. Based on his history, I would take any dog intro’s slow and think he’d do best in a home with females and smaller or submissive dogs. Bama was very excited about meeting new people this weekend and getting whatever attention they would dole out. There are some precautions his new home will need to be aware of such as controlling the speed of his food and water intake so that he doesn’t make himself sick, keeping him away from the cat box because he is a turd burglar, and knowing that if he’s motivated enough (like if he hears your keys jingle) he can jump a baby gate in a single bound. Last, we don't know much about his previous home, but it's worth noting - Bama is terrified of belts. So his furever home will need to keep that in mind when changing clothes or leaving them lie around the house. He is currently accepting applications for families who are looking for a handsome galoot with plenty of love to give but who will also commit to a weekly car ride around the block. July 2 update: Although Bama had aggression issues with a male dog in his previous home, he has done well with his foster sister. He loves to be around people and is obsessed with car rides. He followed me into garage the other day to get something out of my car and was circling it and doing the antsy dance of excitement wanting to get in the car. When I tried to bring him back in the house with me, he stopped and played dead on the garage floor by the car and rolled on his back refusing to go. He thought I was trying to go somewhere without him. The audacity! Bama loves food and water a lot also. He has to be rationed for those or have stopper bowls so he doesn’t try to inhale everything at once and get sick. He gets very excited about exploring new places and likes to lead the way. He is a spunky guy who knows how to turn it down and be a squishy cuddle bear too. Overall, he seems like a sweet energetic boy who enjoys belly rubs, walks, and is looking to interview some people to love and keep him for his years to come. Vet stuff: Bama went in for his vet eval yesterday. Fleas are gone. Skin irritation has mostly cleared up from that. Ear infection in right ear. No dry eye. Mild entropian and stenotic nares, but nothing that requires surgery as of now. Waiting to hear back on heartworm test. Intake info: Bama comes to us from an owner surrender. 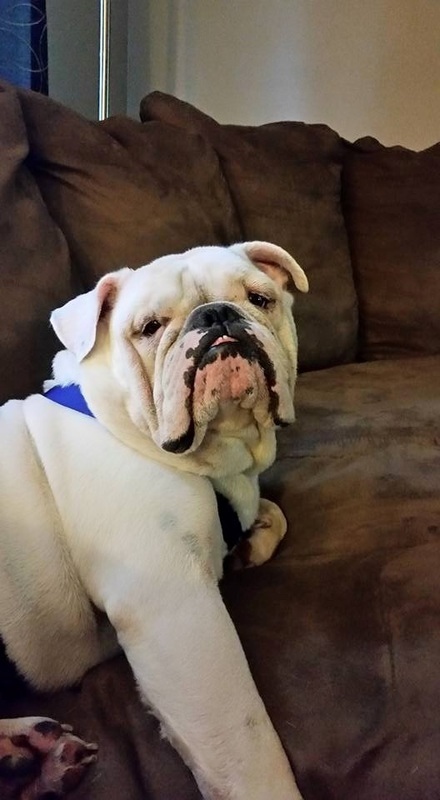 He was bought on Craigslist but was not tolerating the resident male bulldog in the home. He did, however, like the female bulldog and would sleep and play with her. The aggression toward the other male was so bad that they had to be kept separate at all times with each dog having crate time while the other was out. He does well with older kids and has been around younger kids and done fine. Once we have had more time to evaluate his medical needs and personality, we will update more and he will be available for adoption.